You are here: Home � All Deals , Outdoors: Sports Travel Cameras � Cut the grass with the Black & Decker LM175 18-Inch 6.5 Amp Electric Mower for $154.54 shipped. Cut the grass with the Black & Decker LM175 18-Inch 6.5 Amp Electric Mower for $154.54 shipped. Amazon.com is selling the Black & Decker LM175 18-Inch 6.5 Amp Electric Mower for $154.54 shipped. 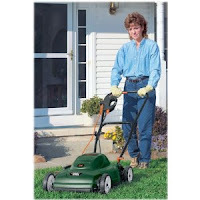 Save yourself from having to buy gas with a top rated electric mower by the biggest name in tools. This product has been reviewed over 180 times on Amazon.com and it has received an average rating of 4 and a half stars. You can also easily adjust the height at which you cut the grass. For more details check out the product page.